This was the second annual Midwest camp and host Will Higginbotham once again did a wonderful job. This year the camp was held at the Marten House Hotel, in Indianapolis. The entire camp went very well with about 70 people in attendance. Students came from as far away as Winnipeg, Canada (an 18 hour drive! ), Salt Lake City, Utah, and Portland, Oregon. From PSCJ, Stan Miller and Jeremiah Reinmiller were at the camp. Sensei Miller taught and Mr. Reinmiller helped instruct. Professor Jay was unable to attend the camp due to health problems, but his wife Bernice Jay came. Soke Dais Ed Melaugh, Ron Ogi, and Lee Eichelberger were there. 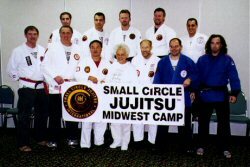 Other instructors at the camp were: Dave Castoldi, Mark Tuthill, Harry Curtis, Chuck Boeri, Steve Rita, Stan Miller, Will Higginbotham, Rob Gale, and Chris Peterson. The seminars covered a wide range of techniques from closing to sport grappling to mug defenses. On Sunday about 30 people went for promotions ranging from yellow to purple belts. The instructors at the camp with Bernice Jay. The people that turned out for the camp. Ron Ogi demonstrates a floating punch in 3 easy steps.